For both Mac and Windows PC users, Photoshop CS2 is the market leader and industry standard for commercial bitmap image manipulation. Also known as the "digital dark room," Photoshop is the unparalleled tool of choice among graphics professionals and hobby photographers alike. Written by 20-year photo retouching veteran Glenn Honiball, Commercial Photoshop Retouching: In the Studio is the only book to deliver advice for the photographer and artist working with Photoshop CS 2 in a real world commercial environment. Honiball offers incomparable technical and artistic guidance for professionals, graphic artists, photographers, and just about anyone involved in creating and manipulating digital images. Production artists face unrealistically tight deadlines and heavy workloads that leave little time for trial and error. Photo retouchers need practical, immediate Photoshop solutions to help them produce quality images with minimal effort and in a short amount of time. All the tools, techniques, and skills you need to achieve consistent, professional results with Photoshop CS2 can be found in Commercial Photoshop Retouching: In the Studio. Anyone with intermediate-to-advanced Photoshop skills--whether you want to explore photo retouching personally or as an imaging professional or student--can use Commercial Photoshop Retouching: In the Studio to produce sharp, expert, extraordinary photos that don't look retouched. Under Honibell's seasoned direction, you'll be able to tackle your greatest photo-retouching challenges with ease, precision and efficiency. He guides you through Photoshop CS2's new and innovative features; explains advanced capabilities; shows you how to adapt and custom-fit the software to meet your needs; offers time-saving tips for accelerating your workflow; and delivers advice and inspiration for exercising your own creative genius. Commercial Photoshop Retouching: In the Studio is the ideal resource for any digital artist who wants to develop and perfect professional-level retouching using Photoshop CS 2. With this book, you will bring photo correction and manipulation to a whole new level. 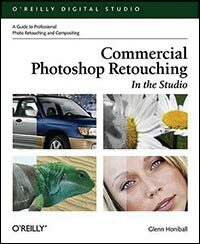 Buy Commercial Photoshop Retouching: In the Studio at amazon.com (34% off). Download a sample chapter - Chapter 2: Shadows and Light in PDF format. Read Jennifer Apple's in-depth interview with Glenn Honiball. See a case study of Glenn's work in our Inspiration Section. PHOTO CREDIT: Flowers shot with a Canon Digital Rebel at macro setting.